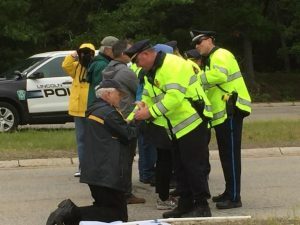 Six peace activists were arrested on May 27 at the gate of Hanscom Air Force Base in Lincoln, Massachusetts as they protested the role of the base in nuclear war planning. Hanscom is the location of the Program Executive Office (PEO) for Nuclear Command, Control and Communications (NC3), which seeks to improve the communications system that would be used by U.S. forces in a nuclear war. 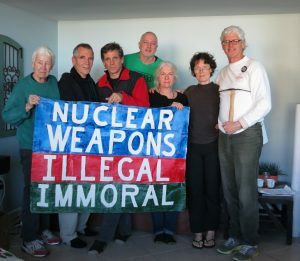 “The money being poured into the ‘NC3’ program are an early warning sign that the government is abandoning any pretense that the U.S. seeks arms control or nuclear disarmament and is rather preparing for nuclear war with Russia, China or both,” said Dr. Jonathan King, a board member of Massachusetts Peace Action, at the protest. 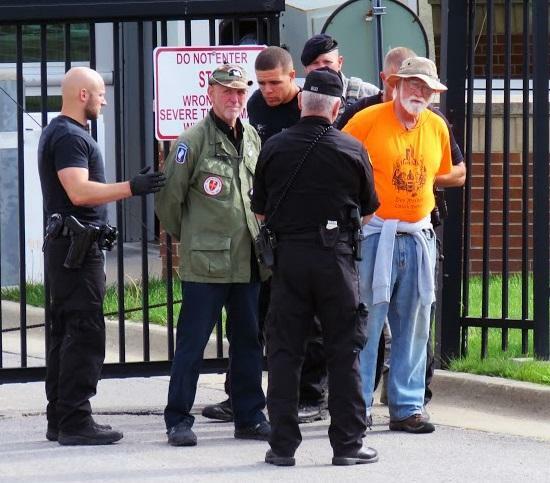 “The money being spent on nuclear annihilation could fund free college and free health care for every American,” he continued. On May 19, Armed Forces Day, members of Veterans for Peace, Des Moines Catholic Worker and Iowa’s religious community held a rally and direct action at the Iowa Air National Guard’s Drone Command Center on the south side of Des Moines. 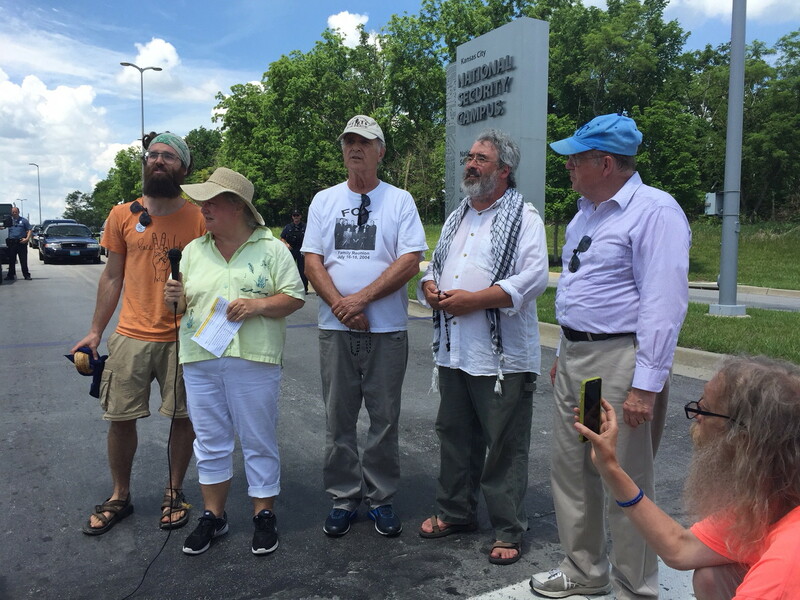 Elliott Adams, former national president of Veterans for Peace, stressed the fundamental importance of diplomacy, rather than violence, in resolving international conflicts. At a May 17 bond hearing in United States District Court in Brunswick, Georgia, U.S. Attorney Karl Knoche told U.S. Magistrate Stan Baker that the government recommended that the seven Kings Bay Plowshares activists be held without bond pending their federal trial for conspiracy, destruction of property on a Naval Station, depredation of government property and trespass. 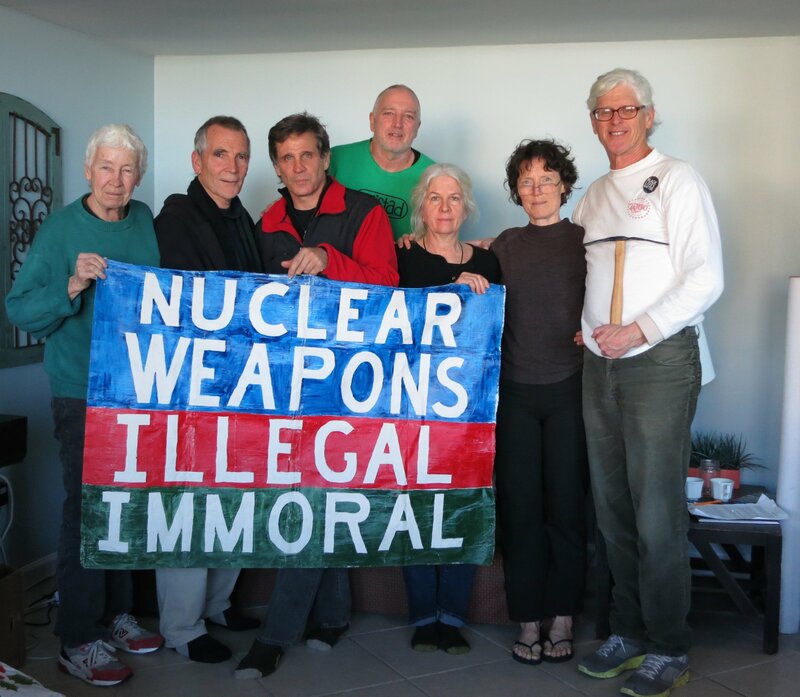 Silverdale, WA, May 12, 2018: Forty-two activists were present at the Bangor Trident submarine base to celebrate the true meaning of Mothers Day for Peace and to protest nuclear weapons. Ten activists symbolically closed Naval Base Kitsap-Bangor for about 20 minutes by blocking the road to the Main Gate in a nonviolent direct action on the Saturday before Mothers Day. 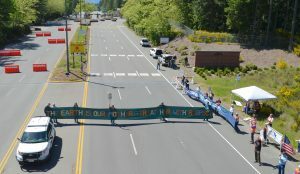 They held two banners across the inbound lanes. One read “The Earth is our Mother. Treat her with Respect”, the other stated “We can all live without Trident”.